The magnetic shape memory effect (MSME), where the change in mangetization of a ferromagnetic material drives a large scale structural change, has many applications. They are commonly used as magnetically-driven actuators, electrical breaker switches, energy conversion, vibration damping, and sensors for magnetic fields or mechanical strain. Heusler alloys have a particularly large magnitude of this MSME. One of the simplest such materials is Ni2MnGa, which at low temperatures exhibits one of the largest known MSMEs, with magnetic-field induced strains as high as 11%. Despite the wide acceptance of this material as a protoype of the Heusler alloys, there are some aspects of the MSME in this material that are not well understood. Specifically, there is at intermediate structural modulation measurable using x-ray diffraction that is also present in an intermediate structural phase. This modulation is thought to be coupled to the magnetism and to be partly responsible for the MSME, but its precise role remains speculative, and in particular its behavior in the intermediate, non-MSME phase remains unclear. In experiments using a combination of ultrafast optical techniques and femtosecond x-ray diffraction, researchers have followed the coupling of magnetism with the dynamics of the incommensurate structural distortion in time after the material is strongly perturbed by the absorption of an intense light pulse. These techniques are able to follow the changes in mangetism and structure as the material is driven into a higher temperature phase that does not exhibit MSME. By measuring the time scale of both types of changes, it is possible to understand better how the two parts of the system are coupled. 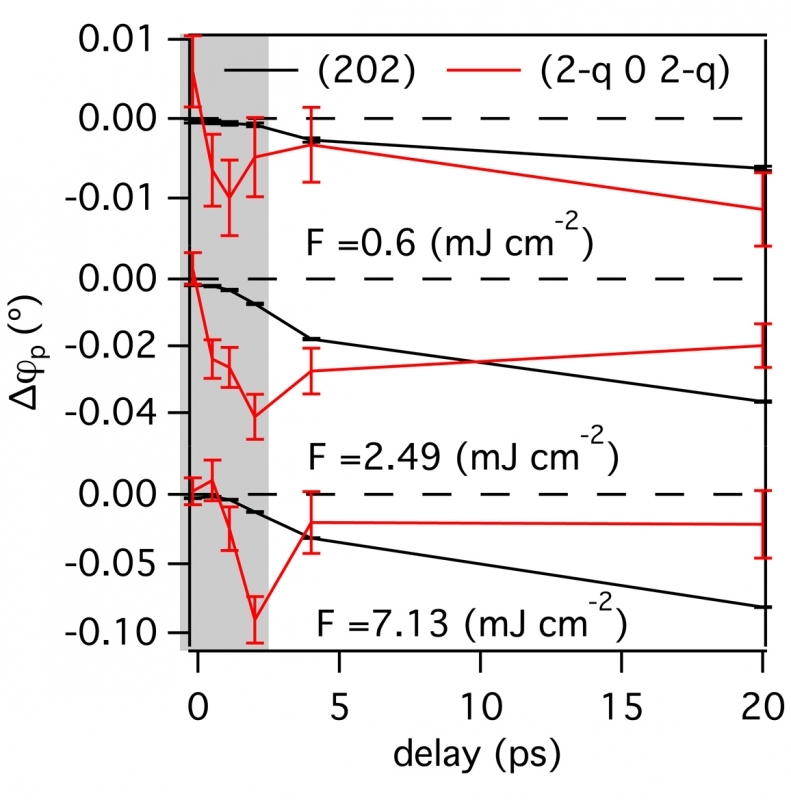 In Ni2MnGa, the laser excitation drives within a few hundred femtoseconds a drop in magnetization, a phenomenon often seen in ferromagnetic materials based on transition metals. After this, the wavevector of the structural modulation shifts slightly, implying that the periodicity of the incommensurate structural modulation changes on a time scale of a few picoseconds. The results suggest that the ultrafast demagnetization drives a nearly immediate change in the shape of the Fermi surface, which redefines the nesting vector that drives the incommensurate structural modulation, offering a new clue on the origin of the MSME in this material. Figure 1: The time-dependence of the wavevector of the incommensurate lattice distortion in Ni2MnGa as measued by x0-ray diffraction (red data points). The black data points show a comparison to the wavevector of the (202) lattice reflection as a point of comparison. The parameter F is the fluence of laser excitation. The data show a transient shift of the incommensurate wavevector that happens after ultraafast demagnetization, occuring on a time scale faster than the time required for an acoustic wave to propagate from the surface across the measured volume.